Implantology is the surgical and prosthodontic discipline relating to implant therapy. It involves the replacement of a missing tooth with an implant. An implant is a titanium screw that is placed into the bone. The bone then grows on to the implant surface in a process called osseointegration. This process takes between 2-6 months and is determined by the type of bone that you have. If the bone is of excellent quantity, then it may be possible to place a temporary crown, bridge or denture at the time of the implant placement or shortly afterwards. This can only be determined at the time of treatment. If immediate loading is not possible, then an impression will have to be taken and a temporary partial denture will be made and fitted either the same day or the following day. There are different types of implants that vary in cost. All implants work, but some implants have specific qualities that allow them to work better under certain circumstances and we will guide you in this selection. If finances are a problem, then we can use more cost effective implant systems that work well, but do not have some of the properties of the more expensive ones. Dr Howard Gluckman is our renowned periodontist, and he has a special interest in implantology. He will surgically replace your missing teeth with one or more titanium screws which then act as an anchor(s) for a denture, crown or bridge in place. He will also rebuild the surrounding destroyed bone or destroyed soft tissue. Patients travelling from overseas should be in South Africa for a minimum of 10 days for the surgical treatment, but ideally for 2 weeks to allow us to check for any possible complications. Should complications arise after you have returned home, you would either have to fly back to South Africa so that we could take care of your problems or you would have to consult a local periodontist at your own cost. We have contacts in many cities and can assist you to find the appropriate person for this. What Can I expect with Implant Surgery? You will have an initial consultation to assess your problems and needs and discuss with you your various treatment options and risks. You will then be given a cost estimation for your treatment. You may be requested to have a 3D CT scan to determine bone volume in the implant recipient sites. infections and secondary decay below temporary crowns and final restorations. It is also recommended that you see an oral hygienist on a 3-monthly basis after treatment to maintain optimal oral hygiene standards to ensure long term success of your treatment.. When a tooth is extracted prior to an implant being placed, it has to be done very delicately (atraumatically) so as to preserve the bone for the implant placement. The implant or titanium screw is placed into the bone. The bone then grows on to the implant surface and this process of osseointegration takes between 2-6 months and is determined by the type of bone that you have. If the bone is of excellent quantity, then immediate loading of the temporary crown, bridge or denture may be possible, otherwise an impression will be taken and a temporary partial denture will be fitted either later that day or the following day. A sinus lift involves raising the sinus and placing bone below it in order to make space for the implant. A bone graft may be indicated where you do not have enough bone available to stabilize the implant. You will then have to wait for about four months for healing before the implant can be placed. Soft tissue grafting is the replacement of soft tissue that has been lost by a disease process. The tissue is usually taken from your palate and transplanted into the area of lost tissue. The soft tissue is essential to ensure health of your underlying bone and integration of your implant. Although implants are extremely successful, there is always a chance that your implants may not integrate due to factors beyond our control. 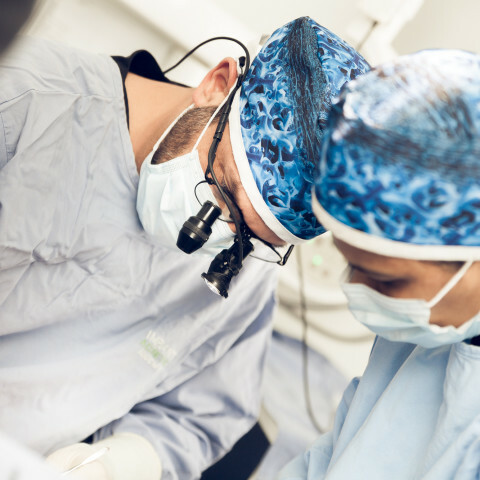 As with any type of surgical procedure, there is also a risk of infection, which can lead to extensive bone destruction necessitating further bone grafting to replace your implant.